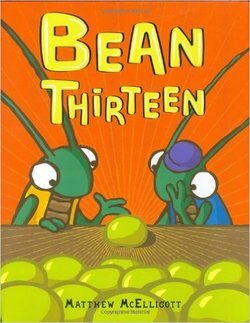 At the time of writing this review, Matthew McElligott’s ‘Bean Thirteen’ (2007) is, as far as we are concerned, the only mathematical story in the market with an explicit focus on properties of prime numbers, specifically thirteen. Not only does this story provide a great introduction to the concept of prime numbers, it can, of course, also be used to teach division and the concept of remainders. The story follows two crickets, Ralph and Flora, who have collected twelve beans to bring home for dinner. When Flora decides to pick one more bean (i.e. Bean Thirteen), Ralph is convinced it will bring bad luck. No matter how many friends they invite to share the beans equally, Bean Thirteen is always there on its own. What would Ralph and Flora do to solve this problem!? The story lends itself perfectly to encouraging young readers to investigate which other numbers have the same property as thirteen. The storyline is engaging and humorous, with believable and cute characters. ‘Bean Thirteen’ is charmingly illustrated by Matthew. The mathematical visualisation is clear, helpful and accurate. Gender representation in the cast is fair. 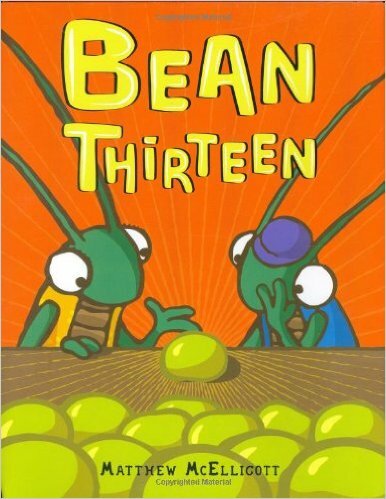 All in all, we highly recommend ‘Bean Thirteen’. Recommended for children aged 7+ years old.